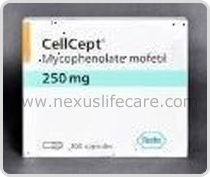 CellCept (mycophenolate mofetil) medicine distributors, dealers & suppliers in Mumbai. Uses:- CellCept (mycophenolate mofetil) 500mg tablet is an immunosuppressant, a medicine that lowers your body's immune system. The immune system helps your body fight infections. Your body may "reject" an organ transplant when the immune system treats the new organ as an invader. An immunosuppressant helps to prevent this rejection. CellCept tablets is used to prevent your body from rejecting a kidney, liver, or heart transplant. CellCept 500mg tablets is usually given with cyclosporine (Sandimmune, Neoral) and a steroid medication. Side Effects:- Abdominal or stomach cramps or pain, black, tarry stools, bladder pain, bloating or swelling of the face, arms, hands, lower legs or feet, frequent urge of urination and drowsiness.